Boston will soon be home the largest Passive House building in the world when it welcomes the new Winthrop Center tower. 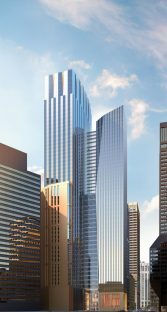 The massive new skyscraper will be constructed at the Winthrop Square site in downtown Boston and reach 691 feet, becoming the city’s third tallest building. While it will feature a mix of residential, office, commercial, and public space, all describe to be state-of-the-art, it is the building’s office component that will truly set the stage for the future. The 750,000 square foot section is being designed to meet the Passive House standard, setting a new record for the size of a single Passive House project. With sustainability as their goal, Passive House just made sense. Developer MP Boston, architect Handle Architects, and energy consulate Steven Winter Associates are all committed to achieving the higher energy reduction possible along with superior thermal and acoustical comfort. The design will result in a 65% energy reduction compared to the average office space in Boston. A remarkable accomplishment that’s truly possible through their commitment to the Passive House standard. One of the many innovated design elements is a current wall using mineral wool insulation along with water and vapor barriers providing a well-insulated and air sealed envelope. We’ll be following this project closely as it goes through the construction process and look forward to the day it opens and helps set a new standard for buildings everywhere. Read more about the Winthrop Center project from Handle Architects.